(Nanowerk News) Much like a tightly wound drum, red blood cells are in perpetual vibration. Those vibrations help the cells maintain their characteristic flattened oval or disc shape, which is critical to their ability to deform as they traverse blood vessels in the body to deliver oxygen to tissues. Blood disorders such as malaria, sickle cell anemia and spherocytosis interfere with those vibrations, so a better understanding of the vibrations could help researchers develop treatments for those diseases. However, the vibrations are nearly impossible to study because their amplitude is so tiny (nanometer, or billionth of a meter, scale), and they occur in just milliseconds. Pictured is an artist's rendering of human red blood cell. Park et al. show that dynamic remodeling in the coupled membranes (lipid bilayer and two-dimensional spectrin network), powered by adenosine 5’-triphosphate (ATP), results in nonequilibrium membrane fluctuations and also maintains the biconcave shape of RBCs. A year ago, a team led by MIT Dean of Engineering Subra Suresh and Physics Professor Michael Feld, director of MIT’s George R. Harrison Spectroscopy Laboratory, reported the first whole-cell glimpse of these membrane fluctuations. Now, in a paper appearing in the Proceedings of the National Academy of Sciences during the week of Dec. 21, they present conclusive evidence that the vibrations require energy input from ATP (adenosine triphosphate), a chemical cells use to store and transfer energy. Previous studies examining only select locations on the cell have led to mutually contradictory results on the role of ATP in influencing cell membrane fluctuations. The MIT team used advanced spectroscopy techniques to examine the entire membrane, and found that ATP is indeed not only critical for the vibrations but it also determines the shape of the cell. They discovered that ATP controls binding between the fatty cell membrane and the interior cellular structure, known as the spectrin network, which is necessary for the membrane vibrations to occur. How they did it: The researchers used diffraction phase microscopy, which quantitatively measures the vibrations in the cell membrane in real time. The optical phase delay, a measure of how much the light is delayed as it passes through the cell, changes as the membrane vibrates. They found that when ATP was depleted in red blood cells, vibrations decreased by 20 percent. When ATP was reintroduced, vibrations increase back to the normal level. They also found a direct correlation between the ATP-induced alteration to membrane vibrations and the length scale of the cytoskeletal structure. This raises the possibility of developing novel diagnostics and therapeutics for blood cell disorders by determining and modulating cell activity through ATP, says Suresh. 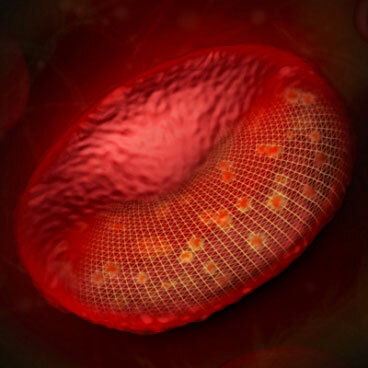 Next steps: The researchers are studying how specific proteins associated with malaria infection of red blood cells affect cell membrane stiffness and vibration, and developing sensitive new diagnostic techniques. Source: “Metabolic remodeling of the human red blood cell membrane,” YongKeun Park, Catherine Best, Thorsten Auth, Nir Gov, Samuel Safran, Gabriel Popescu, Subra Suresh and Michael Feld, Proceedings of the National Academy of Sciences, week of Dec. 21, 2009.